Friday & Saturday, Aug. 4-5—RUTLAND—The end of July and start of August has marked the annual Downtown Rutland Partnership’s annual Sidewalk Sales event for years. This year, it’s being held Friday, Aug. 4, 9 a.m.-10 p.m. and Saturday, Aug. 5, 9 a.m.-3 p.m.
RUTLAND – The Vermont Butcher Shop, the leading proprietor of “honest” meats and victuals from the Green Mountain State and surrounding area, will soon provide the newest ingredient in Rutland’s ongoing revitalization. Motorcycles line the streets of downtown Rutland during a past year’s Downtown Rutland Block Party event. 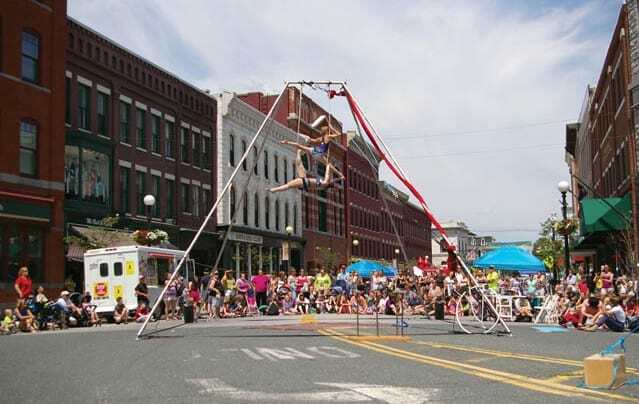 The Little Circus sets up a tall apparatus, with performers flying high above the street on Merchants Row.